This project was a real treat- I had lots of fun doing it! Sometimes, you get a food project, and you really have to give a lot of thought to how you'll go about it, and sometimes you know instantly how you're going to make it happen. This project was one of the latter, I knew immediately that I wanted to do cast latex for that chicken skin feel, and have the flex foam fill for the weight and feel of the chicken. 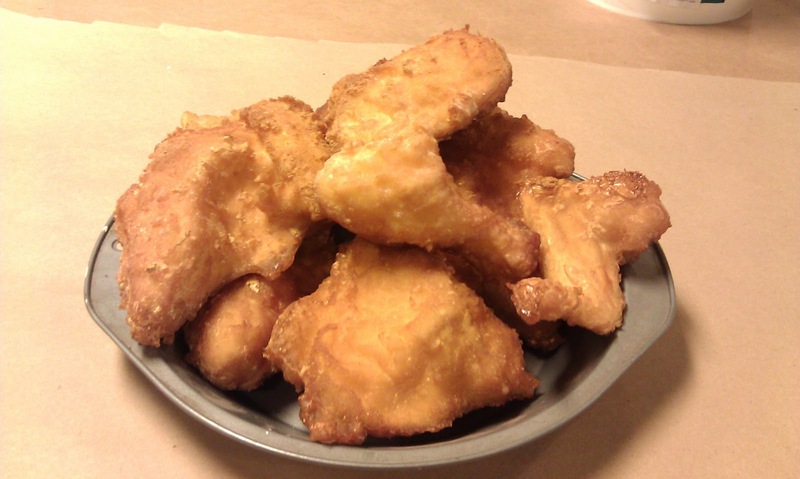 Also, fried chicken is one of my favorite foods- and it's always fun to fake something you love. This was no ordinary chicken! 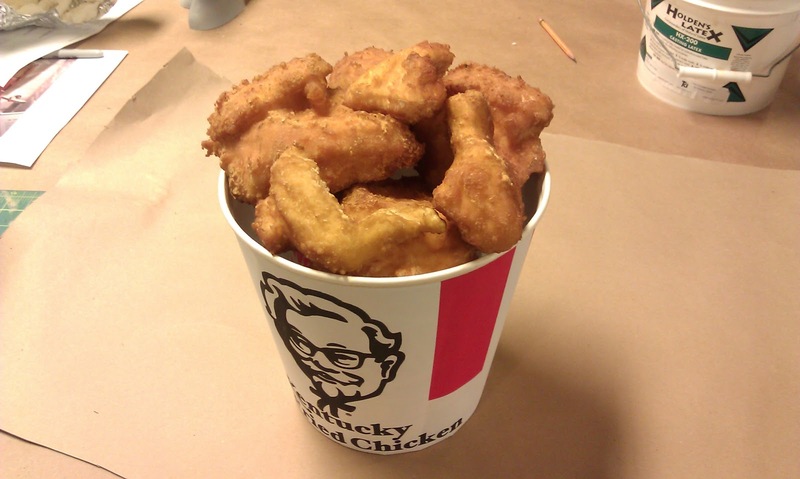 These chicken pieces weren't just going to sit in a bucket, no, these chicken pieces were going to be shot at. In 'Assassins' Squeaky Fromme and Sara Jane Moore use a bucket of fried chicken for target practice. In our production, a pneumatic pin flipped the chicken bucket off of its perch, and the chicken pieces went flying. Okay, technically they didn't go flying, I tethered them with mono filament so that they couldn't get too far away. They went ...hopping. 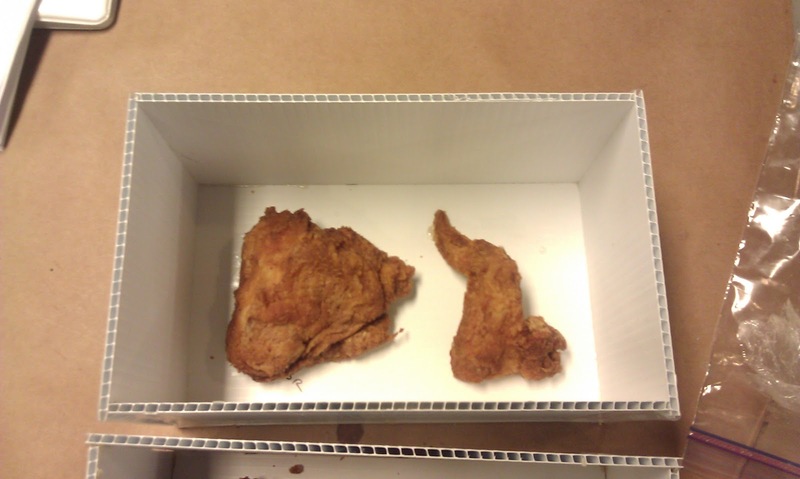 The first step was to make the molds for the chicken. Fried chicken has such a distinctive texture and shape to it that I thought that molding the real deal was the way to go. Now, there are a few caveats when casting real food. Firstly, food spoils, so you have to have a good sense of how long your process will take. Plaster heats as it cures, which can speed up the spoilage process. (There is a story at the rep about an intern and a plaster mold of a cantaloupe that ended in sticky, liquid disaster.) Plaster is also porous, which means that it's pretty hard to get all of the food residue out- so this isn't a good archival mold. You don't want a chickeny smelling mold sitting around in stock growing fuzz. Gross. 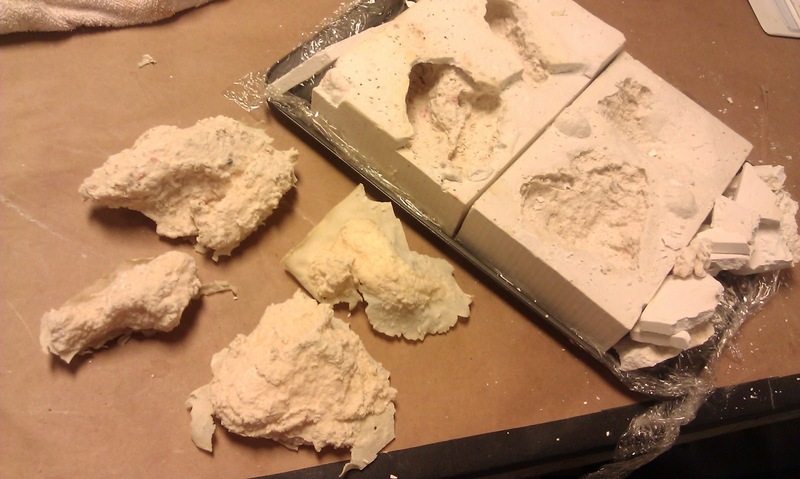 So, you need to make your mold quickly, clean it well, and make your casts quickly. I used a two part mold to make these chicken bits, so I started with a mold box. I stuck the grocery store fried chicken down with hot glue, which worked better than I thought it would, and I used cooking spray as mold release. As the plaster was curing, I had to be careful to sculpt some of it up around the chicken wing to avoid undercuts. Once the first half of the mold had cured, I used cooking spray as a release agent and poured the second half. I think I may have used a bit too much of the spray, I had some oil slick on the curing plaster. The de-mold had to happen almost immediately. After throwing the chicken away, (and giving the pieces that we didn't use to our poor, starving intern) I used dish soap and brushes to thoroughly scrub out the mold. That said, I wasn't able to get out all of the breading bits, due to all the nooks and crannies in the mold. I also had a bit of trouble keeping the mold in one piece. It seems that I made the bottom section of the mold a bit too thin, so I had some breakage during de-mold. Since this was a one-shot mold anyway, and the breakage wasn't too extensive, I decided to piece the mold back together, and go for the casting as is. 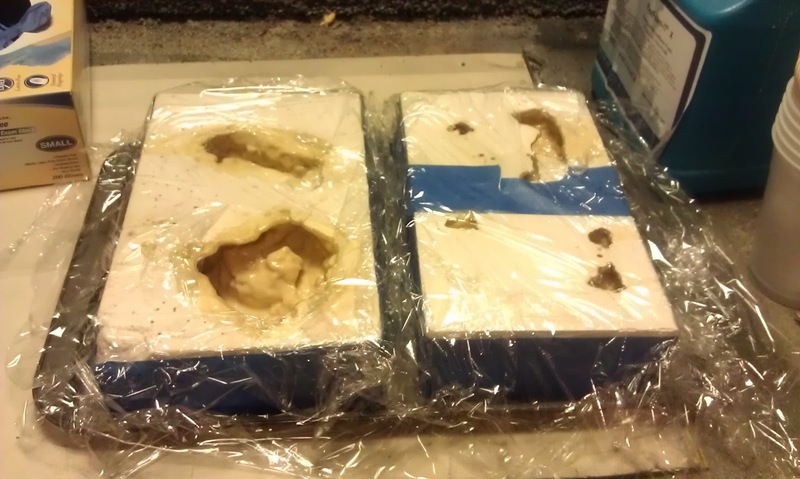 To secure the molds, I wrapped them in plastic wrap and tape. I poured the latex into the cavities, and let them sit and skin up for a few hours. Once I felt that the skin was thick enough, I poured the uncured latex back into the bucket, and let the latex in the mold cure fully. Once the skin was cured, I used flexible pour foam to fill it. This happened in increments, as I didn't want overflow that would ruin the mold. 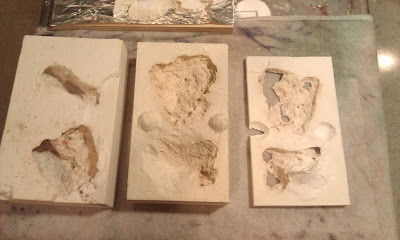 Once I had the fill that I wanted, I removed the chicken pieces from the plaster block molds. This lead to more breakage, which meant a bit of piecing before using the mold the second time. Even with overnight fridge storage, I did end up with moldy molds by the end of the two castings. The mold blocks went into the trash, and we hoped that they wouldn't need more than eight pieces of chicken. We were lucky. The skin is the best part of fried chicken. 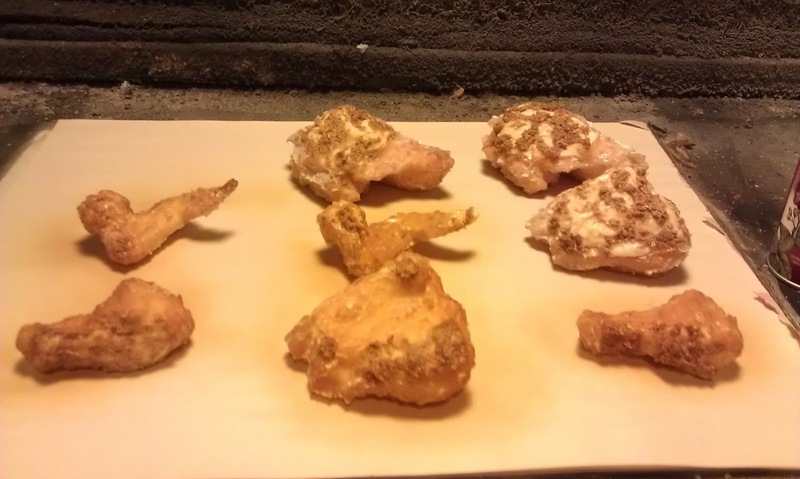 To finish the parts of the chicken that had no skin, I mixed clean sawdust into latex, and troweled it on the bald spots. Once this dried, all that was left was to paint the chicken which I did with the Fake n' Bake kitchen's favorite colors: Design Master Honey Stain and Glossy Wood Tone, I think I even threw on a bit of Chestnut Stain for good measure. Then, as usual, it was all about selling the fake food with the right container. Jill to the rescue again, this period restaurant bucket gave us the perfect showcase for the chicken. And there you have it! This was a fun one, guys. I hope you enjoyed reading about it as much as I did making it. As always, I'd love to see what you guys are working on, so send me some photos! If I like 'em, I'll put 'em on the blog. Happy Propping, y'all. Anna! This blog is really great and informative. I work for the conservation department at Colonial Williamsburg in VA. There I've been making faux food to go into the historical buildings and was wondering if you have any suggestions on making fake soup. I have a few ideas but our dilemma here is the materials have to be safe enough to be around antiques for long pertiods of time. Any pointers would be greatly appreciated! You can email me timidee@gmail.com or answer here if you have time, thanks! Great work! Anna: I like the chicken post very much. I'd take you up on your offer to send you photos of whatever I'm doing but I can't figure out how to do that. I cannot find your e-mail address on your blog, and this comment box does not seem to allow attachments. Send them to propsanna@gmail.com Thanks for following the blog, I can't wait to see your work! Fantastic job. As you say, the packaging gives it the last 5%. I love this blog; glad I found it.